Well, first things first: I really loved this book! Sorry, but I had to unabashedly get this off my chest. 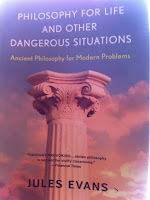 Here is the erudite philosophical self-help book that I always intended to write, but was beaten to it, and then some. 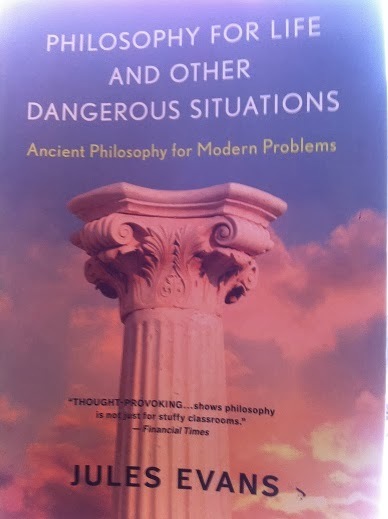 Its full title is even longer than (yet quite similar to) my own blog address: Philosophy for Life and other Dangerous Situations: Ancient Philosophy for Modern Problems. And its author Jules Evans is uncountable steps ahead of my idea to start a philosophy support group that cherishes life's joys and mysteries. All said and done! To make matters worse, he is the same age as me (actually I believe he is younger)! But the similarities do not end there. Here is an excellent and resourceful book that examines the history of ideas with a focus on ancient Greek and early Roman philosophers and relates it all directly to the practice of modern daily life. All of this is done with a healthy sense of humor that does not distract but only adds to its philosophical weight and significance. The journalist-philosopher Jules Evans treats philosophy very seriously and with passionate enthusiasm. When he claims that philosophy is for life (both crucial for one's existence and as a lifelong practice), he really means it. Philosophy has, if not saved his life, at least given him purpose and direction for his own existence. The practical aspects and emotional benefits of philosophy are examined by looking at how it has influenced psychology and how there are a number of direct offshoots of the Socratic method, including CBT (Cognitive Behavioral Therapy) and Positive Psychology to name a few. In fact, CBT functions on the following assumptions that go back to the great Greek philosopher Socrates. The first step is to try to know oneself through vigorous and relentless questioning of one's core beliefs. Once our automatic, subconscious and irrational beliefs come to the foreground, they are rationally analyzed and if valid, accepted; if not, they are discarded and replaced with a new way of thinking. The final step is to continue this new behavior until it becomes automatic and part of one's core identity. This seems rather simple, but it is very difficult to do as we may lack complete honesty, resolution and / or discipline to follow through. For example, let us say that you are socially anxious and think that people are always thinking negatively about you. Then, you would check this belief for its validity. Is it true or it is merely your own fear or your own lack of acceptance of yourself projected onto others? If it is true, then you might need to evaluate reasons why you are not liked or accepted and perhaps adjust your behavior accordingly. If it is all in your head, then you might want to change your negative ways of thinking and replace them with a more positive and, of course, more realistic outlook of how things are (it is indeed quite unrealistic and counterproductive to want to be liked by everyone!). Many focus too much on their failings and let their many successes go by unnoticed or simply shrug them off as matters of sheer luck, which only fosters negativity and low self-esteem. All of this seems most useful for those who are suffering from depression or have had traumatic experiences in the past. One of the things that one learns is to see the world from a different and more rationally balanced perspective. For instance, there are things that we are responsible for, mistakes we have made in the past, both big and small. Sure, but that does not mean that one should club oneself over the head for the rest of one's life. At some point, one has to accept it, try to rectify it (if possible) and then move on. The strange thing about the past is that it is not real. It is emotional baggage that we carry around with us, and it is to a large part our own choice and decision, whether we realize this or not. However, unless we deal with it effectively, it will always come and haunt us and become a self-fulfilling prophecy. If you have had your share of abusive relationships, it is important to focus on the opportunities of the here and now instead of harboring on your negative experiences of the past. In this book, there are real life examples of people who have been sexually abused as children. This is a horrendous experience that I think must be rather impossible to shake off. But this is not about repression or denial. What happens is that victims tend to internalize the blame and see themselves somehow responsible for what has happened to them. This goes hand in hand with the belief that everything that happens to us is our own doing or rather undoing. But that is definitely not true. There are many events and setbacks that are completely out of our control. For example, it seems silly to think that we can control the weather, that we can make it rain or shine. It is equally absurd to believe that we are responsible for today's thunderstorm. Along the same vein, the child did not seek sexual attention, but was abused by others. That child is not responsible for those horrible experiences and must not believe it to be so. I think the fact that we can let go of the past and not be too obsessed about the future can give us a tremendous amount of legroom and freedom. It is breaking the karmic cycle, the negative loopy prison we have gotten used to and caught up in. We can start anew, at anytime, but especially right now. Of course, we cannot create miracles, but we can eventually get somewhere one thought at a time. This is where Stoicism becomes quite relevant. I have previously blogged about how stoicism can change our life, and Jules Evans not only agrees with me but puts it into clearer perspective. His journalistic quest gives us ordinary people from different walks of life (including soldiers, gangsters, astronauts, and anarchists to name a few) for whom stoicism has made a substantial impact. Again, we may not be able to control our environment or things that happen to us, i.e. our fate or destiny, but we can channel our reactions towards them. Evans gives us examples of resilient war prisoners who have even endured torture. Their core beliefs in Stoic philosophy has given them the strength not only to withstand the pains and pressure, but to survive these experiences. They did not break down mentally; they did not let the enemy get inside their heads, and despite all the traumas they came out as victors. One may think of examples of martyrs who withstood pain and death to the very end without giving up or renouncing their beliefs and ideas. It is true that Christianity was strongly influenced by and consciously embraced philosophical strands of Stoicism. In fact, Stoics believed in a kind of unalterable fate ruled by a mysterious Logos and that whatever happens to us needs to be accepted without complaint, just like Job had to go through numerous slings and arrows of misfortune and somehow made it through them all. But this insightful book does not merely look at the Socratic method or Stoicism (they are merely appetizers here), but it comes as a complete menu that includes delightful dishes, including Epicureanist, Platonist, Aristotelian and Cynic morsels, flavors and spices. Jules Evans also successfully made me see that Heraclitus is not the material philosopher I took him to be, but that he was actually rather mystic in his views. We also meet the Skeptics, and their current growth and offshoot linked with atheism and based and fed on by science. They fight against religion with rather crusade-like fervor and with at times equally dangerous dogma. One thing that science must have learned from its history is that facts do no always remain facts but can easily be replaced by other facts and that our knowledge is tentative. Hence you cannot be completely sure of anything and real skeptics ought to be skeptical of that and subscribe more to its agnostic sibling instead of dismissing religion as a whole. Rarely has philosophy been so much fun and easy to follow (just like Arash's World?) and it is amazing how much information is condensed and distilled in these 200+ pages. In fact, Evans has done his research, and he also aptly and suavely references current pop media and film (anywhere from Star Wars to E.T. to Memento) as well as politics. He summarizes the beauty and magic of ancient Greek philosophy without dusty jargon but with pulsating lifeblood. He is not spoon-feeding you philosophical opinions and does not have hidden agendas (except perhaps to make you appreciate philosophy more). In fact, this book gives you the option to choose to set your own moral compass or dance to your own philosophical tune with whoever is to your liking. At the same time, Evans scrutinizes and evaluates each branch or movement in an unbiased and balanced manner and gives each philosopher a fair hearing. There is much to be learned and commended by this. It is a book that poses the question how one should live and offers different viable interpretations to select from. It is a book of enormous value in a world where values need to be valued more than ever.